A few days ago, we published a post about the aromatase inhibiting properties of methoxyisoflavone. An attentive reader sent us a study from a distant past. From 2001, to be precise. 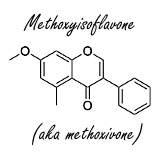 In that study, the same methoxyisoflavone emerged as a body-recompositioning drug. The compound reduced the fat mass of recreational bodybuilders, while increasing their fat-free mass. The researchers divided 14 young men, who trained with weights, into 2 groups. One group took 800 milligrams of methoxyisoflavone daily for 8 weeks, while the other group used a placebo. 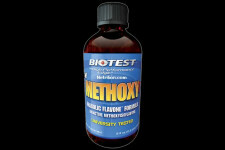 The supplement in this study was Methoxy 7 from BioTest, a product that is no longer on the market. BioTest sponsored the research. The researchers put the groups together in such a way that the groups did not differ in body composition and strength when the trial started. Methoxyisoflavone reduced fat mass and at the same time increased fat free mass. The researchers also looked at the effect on power, but couldn't detect any effect. "Thus, based on our limited sample, the ingestion of 800 mg of methoxyisoflavone daily for eight weeks can favorably alter body composition", write the researchers. The study, which was carried out between brackets by Thomas Incledon, Darin Van Gammeren and Jose Antonio, has never been published in full. The study was once presented at a conference. The abstract appeared in 2001 in Medicine & Science in Sports & Exercise. For five years, Richard Kreider and his colleagues did a little more research. [J Int Soc Sports Nutr. 2006 Dec 13;3:19-27.] This time the results were a bit disappointing. Medicine & Science in Sports & Exercise May 2001 33(5). If you consume a few grams of it on a daily basis, you should be able to eliminate the muscle-degrading effect of the corticosteroid dexamethasone. This is evident from an animal study that American cell biologists from the University of Texas published in 2015 in Aging Cell. According to a patent from the Dutch company Nutricia, galacto-oligosaccharides are interesting for people who want to maintain or enlarge their muscle mass.